Located in Gandhi Hall, Brunswick Road in Withington, a pleasant suburb in South Manchester, Shree Radha Krishna Mandir was the first Hindu temple in Manchester. 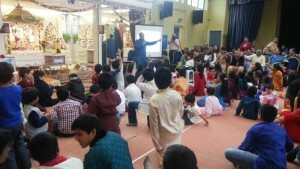 It was established in 1969 by the Indian Religious and Charitable Trust, which acquired the current premises for the purpose of establishing a religious and cultural centre for the Indian community in Greater Manchester. The Trust itself was formed to meet a pressing need felt by the Indian community in the 1960s to have a place of its own, where not only they could meet socially, but also worship and celebrate their social and religious functions. So, it was the result of hard work and sacrifices both in terms of time and money that Gandhi hall was acquired and thus, in a corner of the hall, a Shrine with three Deities was established to serve the need of worshippers. 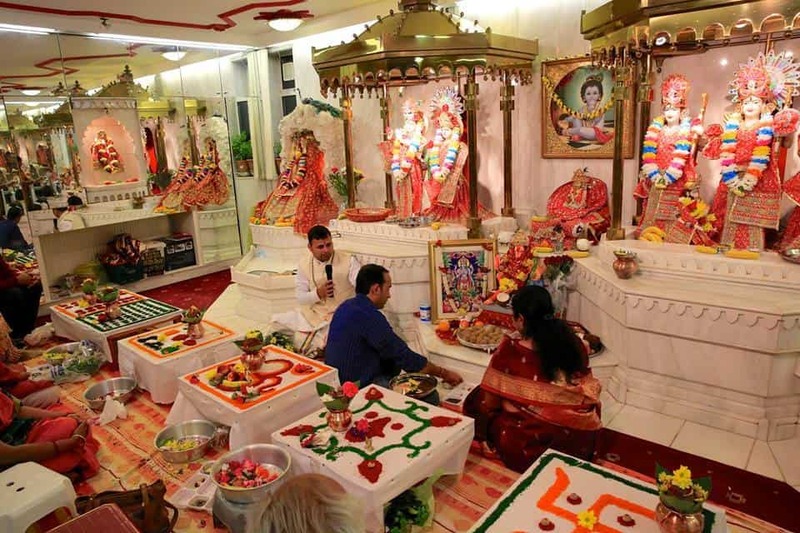 The temple was run by the trust with the help of volunteers, but with the growing activities of the temple, it was felt that it would be better if the temple was run independently of that trust. Thus in 1987-1988 the Hindu Religious Society was formed with it’s own constitution, trustees and membership. 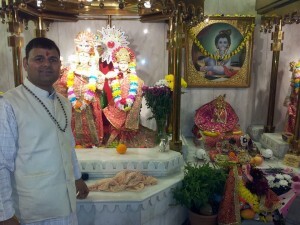 The temple has since been run by the Society and was named Shree Radha Krishna Mandir. Shree Radha Krishna Mandir over the years has seen an increase in the number of devotees visiting it as well as the increase in services offered due to the overwhelming requests from the devotees. As a result, the temple was completely renovated in 1995 at considerable cost. Not only the finest quality of material and craftsmanship was used, but five more Deities were also installed in the temple to the delight and rejoice of the devotees. In 2003, further work was carried out in the temple to create suitable places for Maa Parvatiji and the sthapna of Shiv Linga. Maa Parvatiji was installed alongside Lord Shiva on a special platform which also allowed the installation of the larger Shiv Linga. 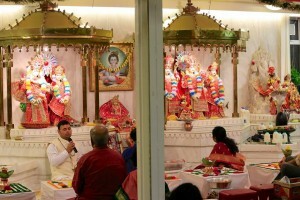 In October 2004, a fire gutted Gandhi Hall, but by the grace of God, the Mandir was undamaged apart from the effects of the smoke. The Hindu Religious Society, the Indian Religious and Charitable Trust and the Indian Association of Manchester, worked tirelessly to rebuild Gandhi Hall. 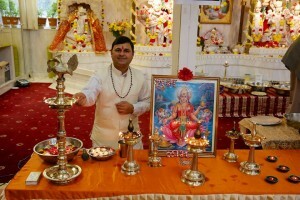 It was through their collective efforts as well as the generosity of the Devotees in terms of time and money that Gandhi Hall and the Mandir was re-opened fully in December 2005. Throughout the time that Gandhi Hall was being rebuilt, even though there was no gas central heating in the Mandir throughout the cold winter months, our Shastriji Krishan Chandra Joshji kept the services ongoing at the Mandir and devotees continued to visit. The child form of Lord Krishna. Ganesha or (Ganesh) is a god in Hinduism, who has the head an of elephant. He is the son of Shiva and Parvati. Ganesha is a very popular god of Hindus. Hindu tradition states that Ganesha is a god of wisdom, success and good luck. He is also giver of different types of favours. Hanuman is sometimes called as Anjaneya, that is, one born of Anjana. He was a devotee of Lord Rama. Durga Mata is a form of Devi, the supreme Goddess. The incarnation of Lord Vishnu who is thought of as the caretaker of the whole Universe. The deity of Lord Krishna’s consort Radha is stood to his left. Is a form of Lord Shiva and is held in reverence in temples all over the sub continent. The Linga is a symbol. It is a symbol of that which is invisible yet omnipresent. It is hence a visible symbol of the Ultimate Reality which is present in us (and in all objects of creation ).The Shiva Linga denotes the primeval energy of the Creator. It is believed that at the end of all creation, during the great deluge, all of the different aspects of God find a resting place in the Linga; Brahma is absorbed into the right, Vishnu to the left and Gayatri into the heart.